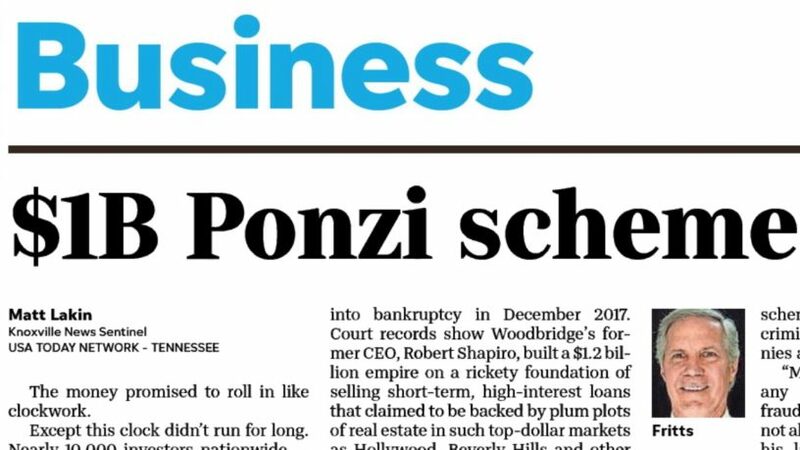 A recent News Sentinel article describes Securities and Exchange (SEC) accusations against Knoxville’s Richard Fritts, owner of Farragut-based Fritts Financial, for selling unregistered securities, the proceeds of which were used to fund a $1.2 billion Ponzi scheme operated by an unrelated third party, the Woodbridge Group of Companies. What the website doesn’t tell you is that 14 years ago Mr. Fritts was accused of doing practically the same thing: selling, to unsuspecting victims, unregistered third-party securities later found to be worthless. Instead of fancy Hollywood houses (the assets supposedly backing the Woodbridge scam), the securities in the previous scam were supposedly backed by complex life insurance transactions, known as viatical settlements. Different wrapper, but the same horrible outcome: a total loss of investor capital. The 2004 complaint alleged that Fritts earned commissions of 13% selling the worthless securities. In this recent complaint, Fritts is said to have earned $842,000 in commissions on the $13.8 million his clients lost – a mere 6 percent. Apparently, raising money for the Ponzi industry just isn’t what it used to be. It is important to note that Mr. Fritts’ current attorney, Lori Patterson, says her client had no knowledge of the Woodbridge fraud. I’m sure Fritts’ victims feel better knowing their trusted adviser and retirement planner isn’t an intentional thief; he is simply so incompetent that he didn’t recognize an investment scam. Again. Or perhaps there is some third possible explanation of how Mr. Fritts directed/advised/suggested that his clients buy securities that, according to the SEC, simply funded a fraud. But logic suggests the explanation is binary: he either knew he was raising money for a Ponzi scheme or he didn’t know. Again, we note that, to our knowledge, Fritts has never been convicted of a crime. The old adage “fool me once, shame on you; fool me twice shame on me” is difficult to apply in the investment industry. It’s not simple to find the disciplinary history of someone hoping to sell you an investment or give you presumably unbiased advice. Someone might be registered with the Securities and Exchange Commission, the Financial Industry Regulatory Authority or with state regulators. Or they may choose not to register with anybody, thereby avoiding pesky nuisances like audits and SEC exams. His attorney’s comments notwithstanding, we can find no record of Mr. Fritts being licensed to sell securities or registered with any governing authority since 2010. Nor does the company Fritts Financial appear in either an SEC or Brokercheck.com search.